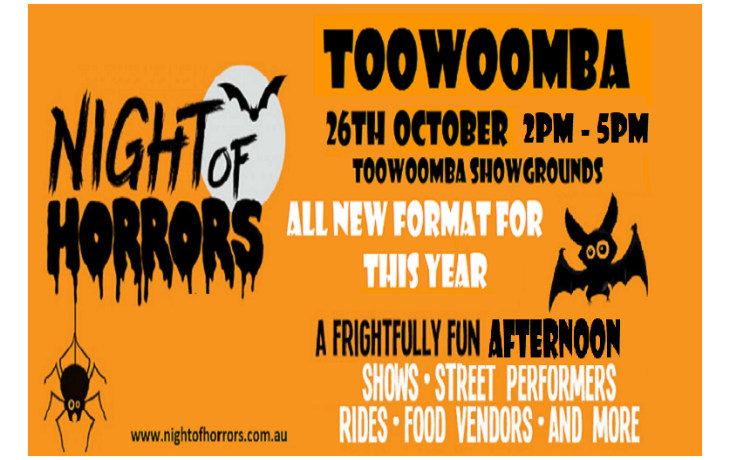 Our Toowoomba Night of Horrors Afternoon Session is recommended for families and teens, and is designed as a carnival event. With a whole new format, there will be less queues, no ride bands, no tokens, no fast track. Horror mazes and the haunted doll will not be running for this session, however, all of the carnival rides and other entertainment will be included as UNLIMITED - ALL AFTERNOON for one fantastic, all inclusive Pre-paid entry fee of $25, SAVE $10 on the normal entry of $35 on the day!! Adults (18+) accompanying children will have free entry - but will not be permitted on rides. But - be warned - there are limited tickets - if they sell out before the day, there will be no more tickets sold! General Admission Ticket - Toowoomba Night of Horrors - Afternoon Session.